With winter settling in here in the Chicago area and most of the country our utility bills can be much higher than other times of the year. I know we'd all like to work on keeping those bills as low as possible. There are things we can all do that will not only lower our bills but be better about our energy consumption as well. 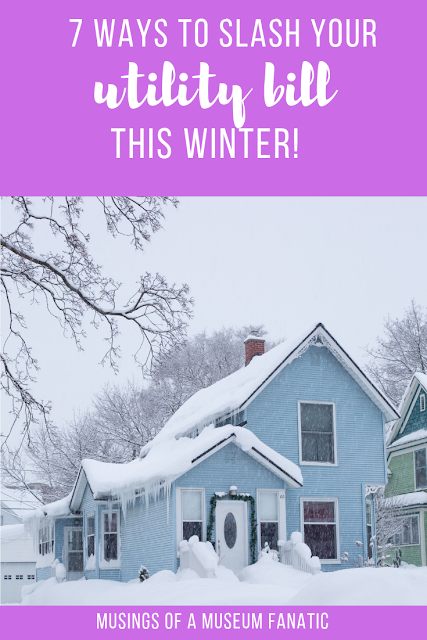 Is there anything you do to slash your utility bill in the winter? This is a huge one not only in winter but throughout the year. If you're not in the room for sure turn off all the lights. Even if you're in a room there might be enough sunlight that you don't need the light on. Maybe you can do with only one light instead of two. Build on your good light habits by changing your light bulbs. If you're able to switch to a more energy efficient light bulb do it! Not only will it save you in your bill but you won't have to buy bulbs as often. This is something that Kevin and I already do with out laundry. I'm not sure why but I've just always washed clothes cold. Probably because I'm scared of any bleed from color! Either way it's been something that helps our bills out. If you don't need to heat the water you don't need to pay for that heat, simple as that. Plus no worries about pink underwear! I've read a lot of articles lately that have mentioned if you reduce your temperature by 5-10 degrees you can save something like 5% on your bill. Most of us won't even notice the different either! Put socks and a long sleeve t-shirt on and you won't even notice that difference. Unplugging is another year round utilities saver. Have you ever heard the term phantom energy? Well that's when you item like a curling iron is turned off but still plugged in. Since the curling iron is still plugged in it's still drawing energy! There are a few things we've found throughout the house that really don't need to be plugged in all the time, like our electric tooth brushes and the toaster. What items do you leave around your house that could be unplugged? This is a must do each year when you live in the north. It's never a good thing to find out in January when your furnace goes out that this could have been prevented by the yearly check. The yearly check also helps you to keep parts like the filter in tip top shape. This might seem like an odd one but it can really make a difference! If you shut your drapes you're adding another barrier between the cold glass and the warm room. This helps to insulate the room better. It can especially be helpful during the night. Even if you don't have fabric drapes closing the blinds can definitely help.